If you are requesting financial aid for the 2018-19 season, please fill out the financial aid form and scan/email to tonya.admin@boernesoccer.org along with the required documentation. We will start accepting new applications for the 2018-19 season on May 1, 2018. Financial assistance is available for players who have been offered, and accepted, a spot on a FC Thunder Select Team. Funds for assistance are limited and the amount of an individual award will be determined by the number of qualified applicants requesting assistance and the total amount of funds available. Assistance is only awarded to reduce an amount of the registration fee and may not be applied toward costs of uniforms or any other team-specific additional expenses. 1. 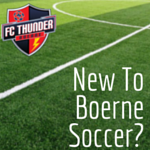 Boerne Soccer Club is committed to each player for a full year and we expect each player to be committed to BSC for the year as well; therefore, there are no refunds. The soccer season for BSC begins on June 1 and ends May 31. All monies paid to Boerne Soccer Club are non refundable. 2. In the following situation, an exception to #1 may be requested and seasonal fees may be pro-rated and credited towards the next season registration fees. All such requests must be formally submitted to the Board for their approval. Injuries – Boerne Soccer Club players who incur a season-ending injury (confirmed by medical documentation) during a BSC sanctioned event, are eligible for a credit of the portion of his or her Training Fee which covers the remainder of the applicable season, dating from the time the player’s parent notifies the Club that the player is unable to participate further in the season due to the injury. A parent and/or guardian must notify the Director of Administration, Tonya Vicknair, in writing within 48hours following the game or practice in which the BSC player suffered the injury. Failure to do so can void possible refund.